The regime of embattled Syrian dictator Bashar Assad is actively working to enlarge its arsenal of chemical weapons, U.S. officials tell Danger Room. Assad’s operatives have tried repeatedly in recent months to buy up the precursor chemicals for deadly nerve agents like sarin, even as his country plunges further and further into a civil war. The U.S. and its allies have been able to block many of these sales. But that still leaves Assad’s scientists with hundreds of metric tons of dangerous chemicals that could be turned into some of the world’s most gruesome weapons. Back in July, the Assad regime publicly warned that it might just use chemical weapons to stop “external” forces from interfering in its bloody civil war. American policy-makers became deeply concerned that Damascus just might follow through on the threats. Since the July announcement, however, the world community — including Assad’s allies — have made it clear to Damascus that unleashing weapons of mass destruction was unacceptable. The message appears to have gotten through to Assad’s cadre, at least for now. Talk of direct U.S. intervention in Syria has largely subsided. That hardly means the danger surrounding Syria’s chemical weapons program has passed. More than 500 metric tons of nerve agent precursors, stored in binary form, are kept at upward of 25 locations scattered around the country. If any one of those sites falls into the wrong hands, it could become a massively lethal event. And in the meantime, Assad is looking to add to his already substantial stockpile. “Damascus has continued its pursuit of chemical weapons despite the damage to its international reputation and the rising costs of evading international export control on chemical weapons materials,” the James Martin Center for Nonproliferation Studies, a leading think tank on weapons of mass destruction issues, noted in an August profile of Syria’s illicit arms activities. Whatever the rationale, Assad is continuing his attempts to buy the building blocks of nerve agents like sarin. The CIA and the U.S. State Department, working with allies in the region, have recently prevented sales to Syria of industrial quantities of isopropanol. Popularly known as rubbing alcohol, it’s also one of the two main chemical precursors to sarin gas, one of the deadliest nerve agents in existence. The other precursor is methylphosphonyl difluoride, or DF. The Syrians were also recently blocked from acquiring the phosphorous compounds known as halides, some of which can be used to help make DF. In June, Jane’s Defence Weekly reported that North Korean engineers were spotted in Syria working on Scud-D short-range ballistic missiles, which can carry chemical warheads. Two months later, witnesses tell the German magazine Der Spiegel, Syria test-fired several of its chemical-capable missiles at the al-Safirah research center east of Aleppo. Among American policy-makers, there’s a growing sense (perhaps a bit wishful) that Damascus will eventually fall to the rebels — despite Assad’s brutal crackdown on the uprising, and despite an often-haphazard international campaign to help the rebellion. On Thursday, rebel group announced that they had seized two more districts in the city of Aleppo. U.S. intelligence agencies are believed to be helping with the training of opposition groups, while the Pentagon denies shipping arms to the rebels. In public, American aid has largely been limited to organizational advice (Washington is trying to set up a council of opposition leaders in Doha in the next few weeks, for instance) and technical assistance. Several hundred Syrian activists have traveled to Istanbul for training in secure communications, funded by the U.S. State Department. The rebel leaders received tips on how to leapfrog firewalls, encrypt their data, and use cellphones without getting caught, as Time magazine recently reported. Then they returned to Syria, many of them with new phones and satellite modems in hand. In the background, the U.S. is also starting to strategize for how it should operate in a post-Assad Syria. And that includes scoping out plans for disposing of Assad’s stockpiles of nerve and mustard agents. It won’t be easy: Iraq’s former chemical bunkers are still toxic, a decade after Saddam’s overthrow. 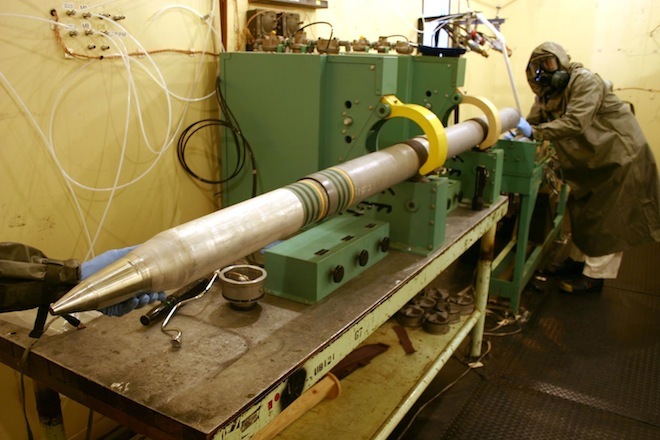 The U.S. recently said it won’t be done disposing of its Cold War chemical weapon arsenal until 2023. Disposing of chemical weapons might not be as touchy a political issue in Syria as it is in America. But Assad’s nerve agents will still be tricky to render (relatively) safe — or “demilitarize,” in weapons jargon. DF, for example, can be turned into a somewhat non-toxic slurry, if combined properly with lye and water. The problem is that when DF reacts with water, it generates heat. And since DF has an extremely low boiling point — just 55.4 degrees Celsius — it means that the chances of accidentally releasing toxic gases are really high. “You could easily kill yourself during the demil,” one observer tells Danger Room. Naturally, this process could only begin once the DF and the rubbing alcohol was gathered up from Assad’s couple dozen storage locations. Then, they’d have to be carted far, far out into the desert — to make sure no bystanders could be hurt — along with the enormous stirred-tank reactors needed to conduct the dangerous chemistry experiments. And when it was all done, there would the result would be a whole lot of hydrofluoric acid, which is itself a poison. In other words, even if the U.S. stops every one of Assad’s chemical weapon shipments from here on out, the legacy of his illicit weapons program will linger on for decades.